Our Farmers’ Market celebrated its 10th anniversary last weekend (although the actual date was back in June). It’s hard to remember back to a time before farmers’ markets, when it was nigh on impossible to shop for local produce unless you happened to live near a supplier. Scotland’s produce is now prized at top restaurants here and abroad. 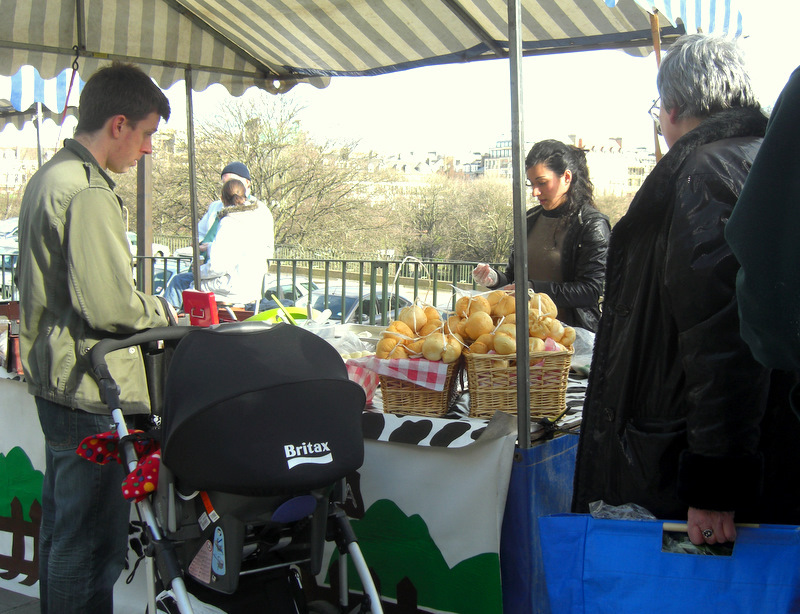 Many new food businesses have started (and thrived) on the back of regular attendance at markets. I am so frustrated with our market here. The company running the market often seems to be far keener on promoting foreign markets fetching up in Castle Street selling overpriced produce than ensuring that the farmers’ market thrives. We have some truly world-class suppliers, but who is singing their praises? Where was the support needed throughout all the building work at the Usher Hall that reduced the number of parking spaces making it difficult to park anywhere near the market with the exception of the overpriced NCP car park (how many shoppers actually want to park for 2 hours and for more than £5?). As the number of permit holder places increased, where was the encouragement for shoppers to come to the market? Did anyone log how much less the stall holders received each week? Special Saturday parking could be introduced, or validated parking if you shop at the stalls. Where is the support for those who come on their bikes? Do you remember the last time you actually saw some advertising for the market? Did you even know that the 10th birthday was being celebrated? Market it to the locals, not visitors – they’ll not be buying meat to taken home with them. In Portland, you can use your credit card to purchase items (by a token system); there’s a vegetable valet where you leave your heavy bags of vegetables then drive by in your car later to pick up; a lively interactive website (you can find where your chosen stall is located); token matching (for those on lower incomes), a full programme of appropriate events and much more. So we will continue to brave the parking problems and visit Edinburgh’s market as often as we can. On Saturday we found cherries from Perth (yes – grown in pots in a polytunnel), strawberries, tomatoes, fresh fish, meat, vegetables, eggs, cheeses, German baking, Italian baking … – oh and also a Ceilidh band and an MC at 9 am in the morning (hmmm). Come on Edinburgh, you can do SO much better. What do you think?